Who needs scented candles around the holidays when all you have to do is roast some almonds?! These Skinny Honey Roasted Almonds are amazing! I can't tell you all how great my house smells right now. Even my 6 year old (who doesn't care for almonds) ran into the kitchen to ask me if she could have some of whatever it was I was cooking. And trust me when I say that they taste every bit as good as they smell! I love almonds for so many reasons, and I've always got some tucked away in my pantry for quick and easy snacking. Almonds carry a massive amount of nutrients: fiber, protein, healthy fats, and vitamin E to name a few. They are completely loaded with antioxidants and can even help control blood sugar. It helps too that they are great for helping to lose weight too. The only way to make almonds any better in my opinion is to add a bit more flavor to them by smoking or roasting. And honey roasting has to be my most favorite option. There's just something about the mix of sweet and salty that make a winning combination. 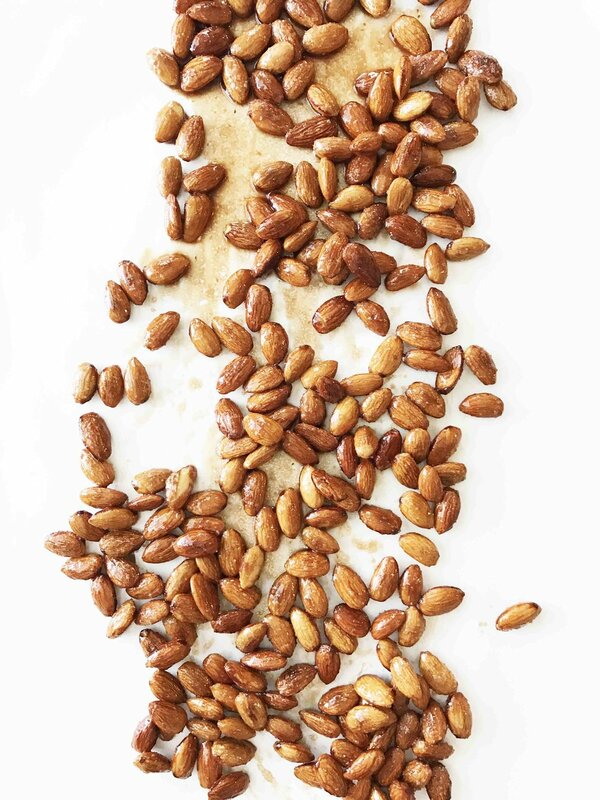 Now for the part that most might find tricky, lightening roasted almonds up. Wait, wait! Just hear me out. I've found that there is a simple and easy way to do it! Whole Earth Sweetener Co. products. They are great tasting, zero and lower calorie sweeteners crafted with non-GMO ingredients for a blend of the world’s best sweeteners. For these honey roasted almonds I used the Whole Earth Sweetener Nature Sweet® Packets and the Whole Earth Sweetener Honey 50. Whole Earth Sweetener Nature Sweet® Packets are zero calorie and non-GMO. Whole Earth Sweetener Honey 50 has 50% fewer calories than traditional honey per serving, is Organic, and Non-GMO Project Verified. Use 1/2 as much for same sweetness and 50% fewer calories as traditional honey. Once said and done, I ended up with perfectly sweet and salty roasted almonds that have less sugar per serving than what most other recipes out there may call for. Leaving me with a guilt-free snack that I'm happy to share with friends and family around the holidays! And the best part is, no one will ever guess that these are better-for-you. These tasty little tid bits are a great snack, and I actually prefer to keep them in the fridge or freezer for an even more crunch worthy snack. But, there is definitely no right or wrong way to eat or gift them. Yes, that's right! They make a great gift too and can be made well ahead of time whether for gifting or your next holiday spread. You can find Whole Earth Sweetener Co. products at a store near you, or on Amazon (which is where I got mine.) The Whole Earth Sweetener Nature Sweet® Packets are also available at Starbucks on the condiment bar! If you are planning on gifting these, I suggest using glass mason jars for quick and easy packaging that's also fun to decorate! Other than that, you'll want to keep them in an airtight container. Watch them magically disappear! Preheat the oven to 350 degrees F. and line a baking sheet with foil for easy clean up. Spread the 2 C. almonds out in a single layer on the baking sheet and place into the oven to bake for about 15 minutes, stirring occasionally until the almonds are toasted and fragrant. While the almonds are toasting, in a small bowl mix together the 3 Tbsp. Sugar, 1 Tbsp. Whole Earth Sweetener Nature Sweet®, and 1 1/2 Tsp. Sea Salt; set aside. Place the 3 Tbsp. Water, 3 Tbsp. Whole Earth Sweetener Honey 50, and 1 Tbsp. Coconut Oil into a small sauce pan and bring to a bowl. Once the almonds are done, add them to the sauce pan and continue to cook until nearly all of the liquid is gone from the bottom of the sauce pan. Sprinkle about 2 tbsp. of the sugar and salt mixture into the almonds and stir. Pour the almonds out onto a sheet of wax paper and sprinkle with the remaining sugar and salt mixture. Allow the almonds to cool completely. I even put mine into the freezer for about half an hour to speed up the cooling process. Break apart once cooled and enjoy!